Our purpose designed cattery provides multi-level living for your cat with interesting platforms connected by ramps. All our cabins provide a light and airy space for the summer months but are in a fully central heated building meaning they are cosy and warm in the winter months. All our cabins have access to outside balconies through a standard cat flap enabling them to get fresh air when they wish. 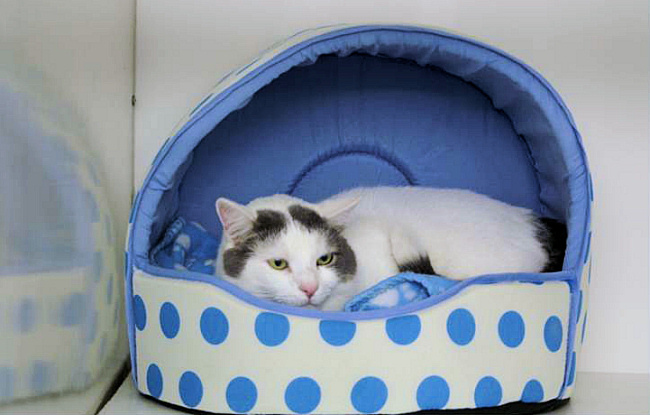 Our Cat cabins are equipped with scratching pads and soft cosy beds, litter trays, feed and water bowls are also all supplied by us along with the cuddles and attention your cat demands. All that you need to bring is your cat in a secure cat box and the current vaccination card. All our cat pens are large enough for two cats as long as they are from the same household and they are compatible to share. As with the kennels, we are able to cater for any special needs and dispense any medications if required , but it is essential for any special needs to be discussed with a member of our team in the first instance so that a special care plan can be formulated in advance of their stay.